When I joined Church High in 1985, one of the rooms I was most proudly shown on my tour of the school was the Sixth Form Study at the top of Tankerville House. I remember it being a contemplative space under the eaves with light flooding in through large dormer windows. Directly opposite the main school, Tankerville was bought to house the Junior School in 1927. 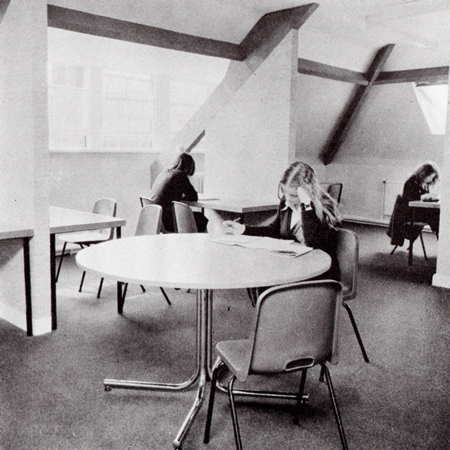 On the opening of the modern Junior School, it was altered and completely modernised for Sixth Form usage in 1977. As I approached the main building top floor via the original south staircase on May 18th, it struck me that, once again, a Sixth Form study space in the roof eaves was destined to become one of the show spaces of the Tankerville Terrace site. 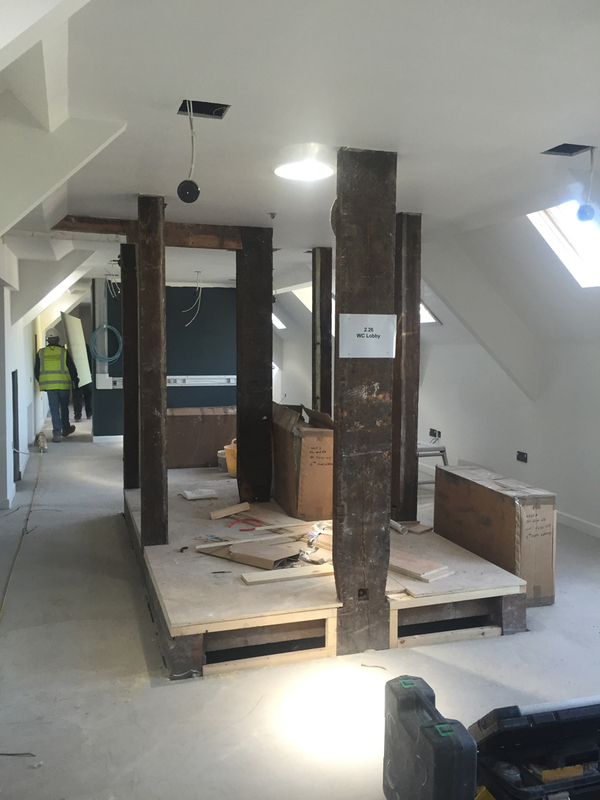 The top floor which housed Church High’s administrative offices for many years is now transforming into the NHSG Sixth Form Library. 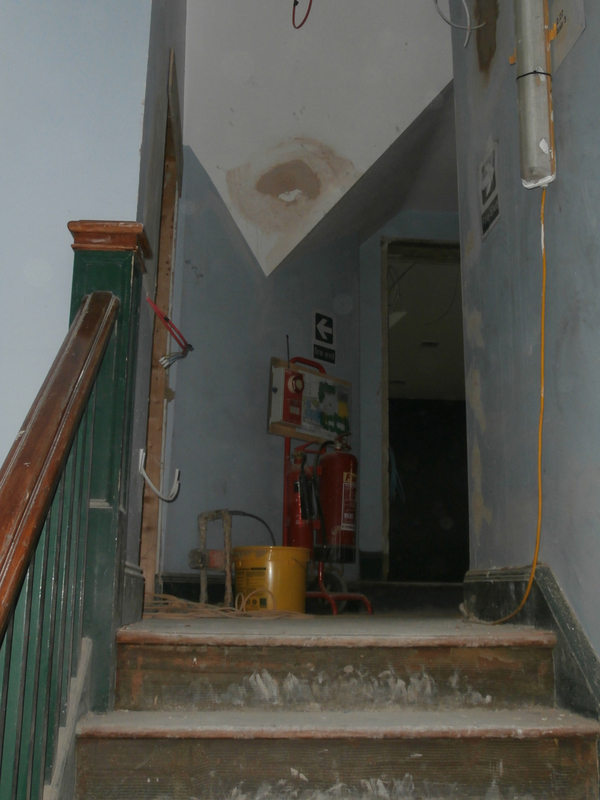 The original features of the south stairs have been retained. 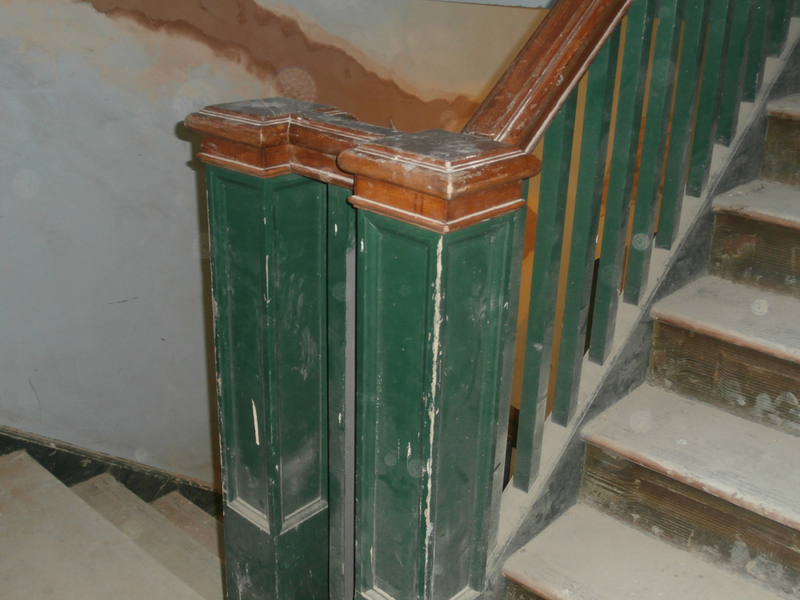 On May 18th, the south approach to the top floor still looked more than a little unpromising, but for me it was nice to see that after almost two years the banisters were still green and walls pale blue. Even now, walls are still blue and wood green. The first door to the left at the top of the south stairs I know as the Marketing Office, though in the last years of Church High it also housed the Head of Pastoral Care, the SEN Co-ordinator and the Director of Studies. In NHSG, it is to be a 6th Form Tutorial Room. 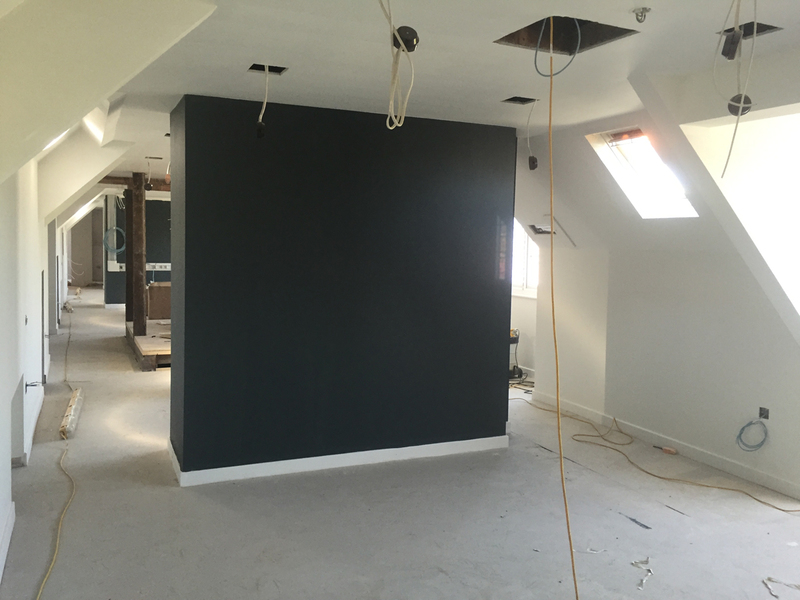 The west south-gable eaves room on May 18th, looking east. I remember this room being created, probably somewhere around 2008. It was the last bit of the roof to be converted into offices. The east room, latterly the office of David Cocallis, IT Technician & Systems Manager, was created circa 1988 when GCSEs replaced GCE ‘O’Levels in order to provide a secure storage area for coursework. Both south-gable eaves offices were created by lowering the ceilings of the rooms below. 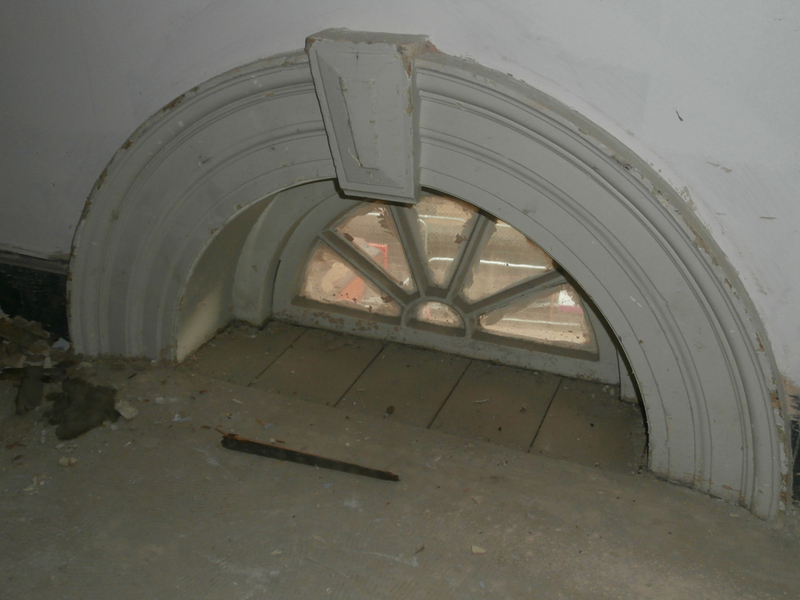 In this case, Maths Room 8, a room which began its life as a Science Lab in 1890 hence the little roof ventilator – an original feature I intend to explain more fully in a future post. 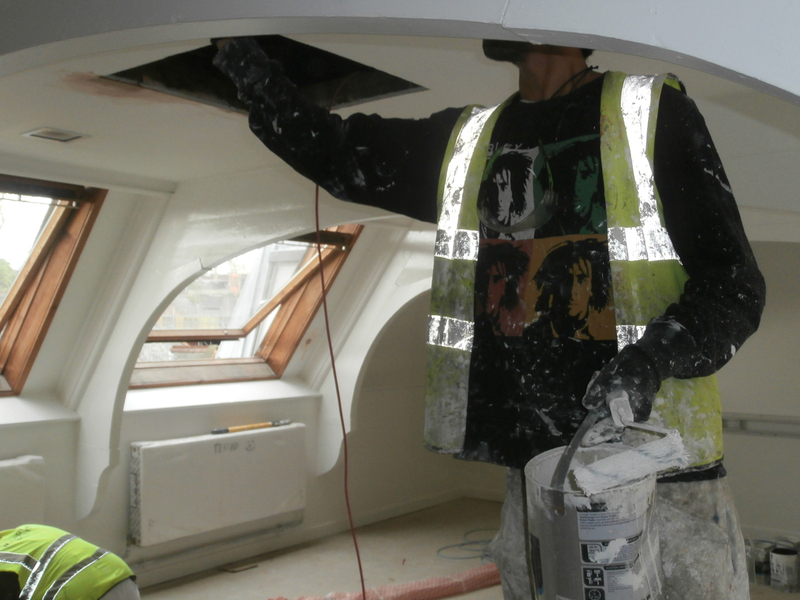 Painter at work in Room 26 applying ubiquitous white emulsion. 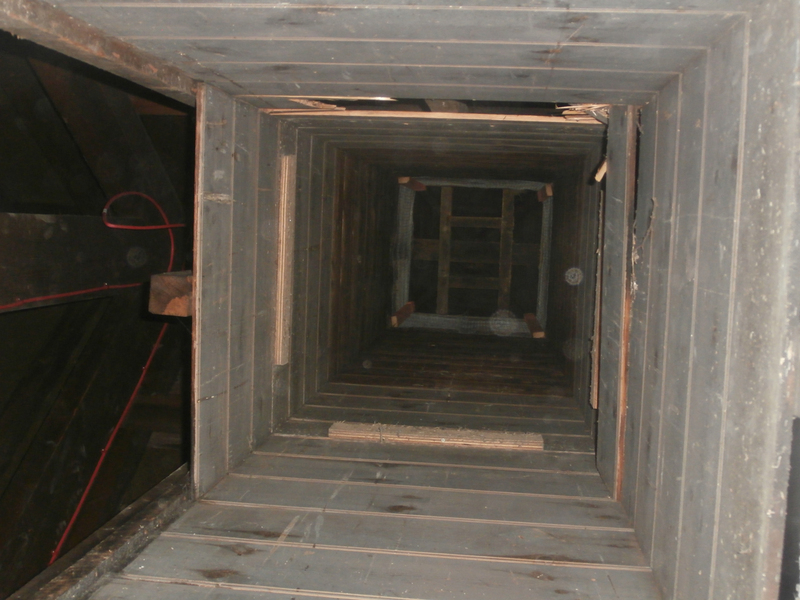 The open hatch in the ceiling behind the man’s right arm is the original Victorian fresh-air ventilation shaft (below). 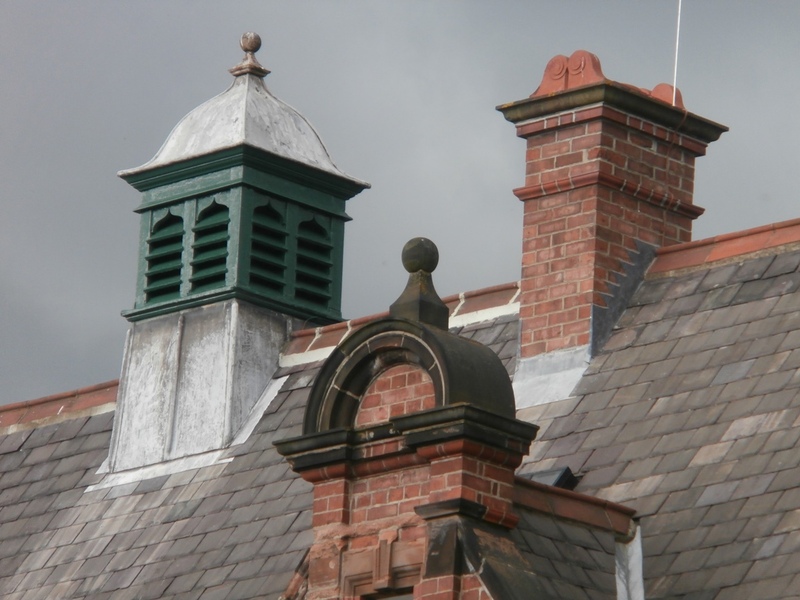 The old Victorian north gable roof ventilator on May 18th. 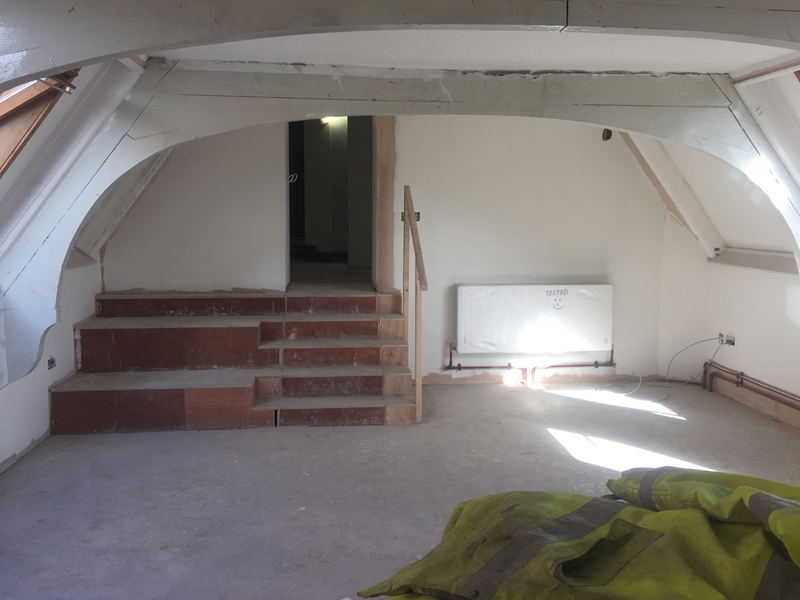 Originally converted to house the caretaker in the 1950s and then turned into administrative offices in the eaves, the long roof-space will now serve as the 6th Form Library at NHSG. Now fully painted, the feel of this space had altered quite a lot since I was last up there. The newly-painted eaves roof space looking south to north. The load-bearing wooden bell-tower support beams were still in their original state that day, but there was now evidence that carpentry work was in the process of being carried out around the base. 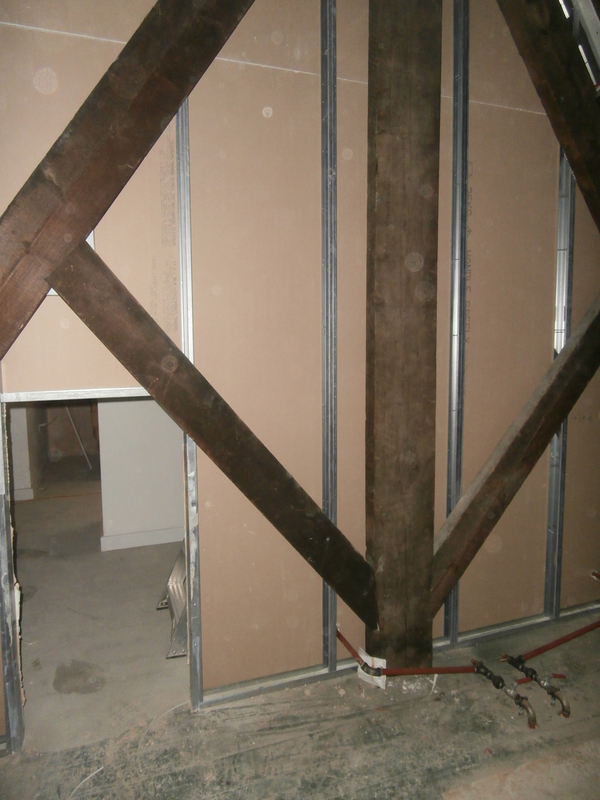 These wonderful old oak beams will remain in situ, though not in their rough original state. The main change was all the electrical wiring. 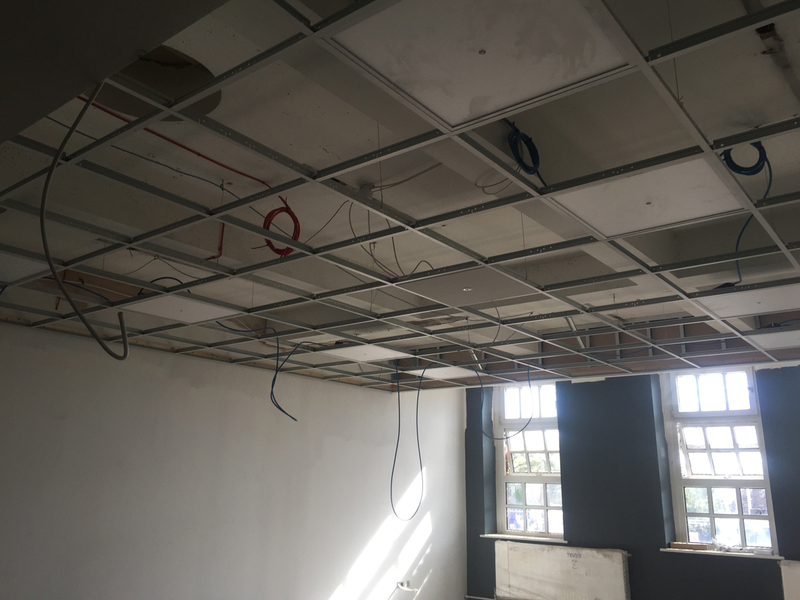 Not only was the new lighting system in place, but the roof space also now appeared to be fully cabled out with Cat6 to allow digital internet access. This room will also undoubtedly become a hub of wi-fi activity at NHSG. Blue Cat6 cabling denotes this will be a key IT access point. The old office dormer windows are now to be window study seats. Access points show the window bays will house study seats. Although the windowed east-eaves will be utilised in the new design, as they were at Church High, it looks like the west-eaves won’t be. The Church High IT storage space looked like it was in the process of being sealed off. Indeed, a stud wall was already in place across the entrance to the north-gable eaves, where the hatch on the very top landing used to be. 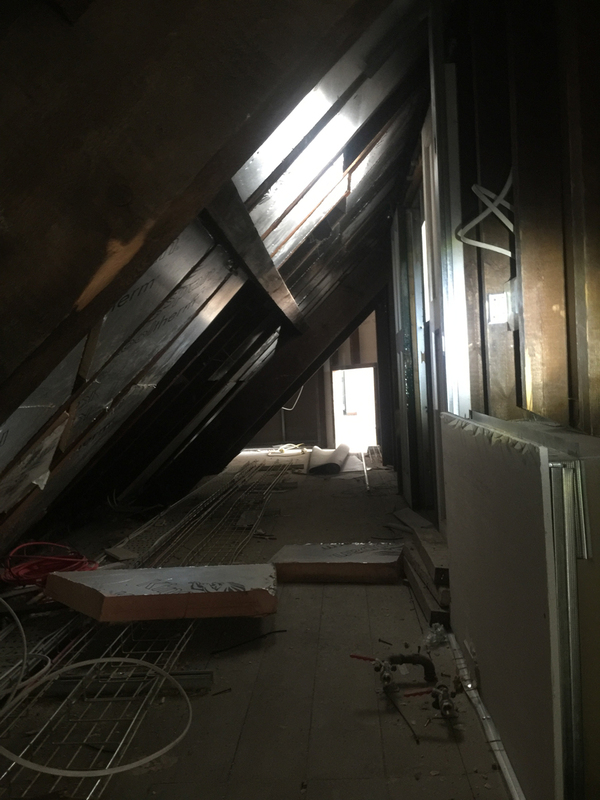 The only existing main building roof trusses, which used to make the Church High Server room so quirky and atmospheric, are to be walled off in the new design. Whilst this will protect them, a glass panelled wall would have been fabulous. The long space in the west eaves (above) is being insulated and the king posts in the north gable eaves are now almost sealed off (below). But just as old openings were being closed off, new ones were still appearing. Clearly, the old building’s new lift shaft had always ‘been there’, but that day its size and shape was becoming really obvious. 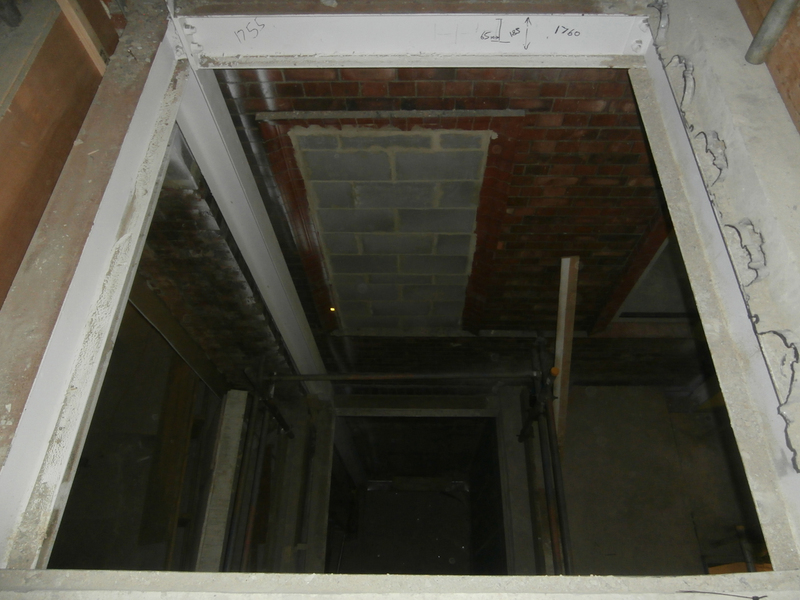 The new lift shaft in the old building infill, positioned just outside of Mr Farrell’s IT Manager’s Office window, looking down onto the first-floor landing of the infill’s new north staircase. The IT Manager’s Office – formerly Sickbay – doesn’t exist anymore, but if you ever have cause to wait for the lift on the top floor (should you be lucky enough to have a key for it), then that’s exactly where you will be standing. 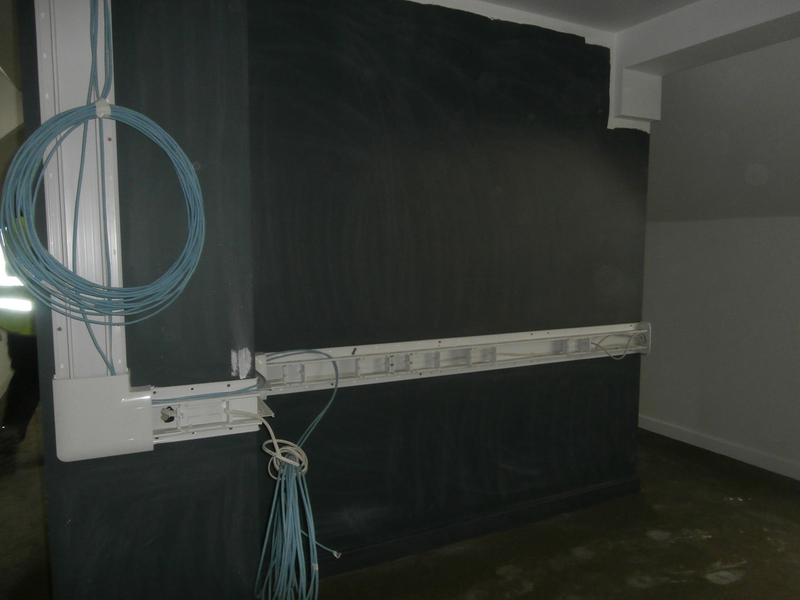 The ICT Suite remains, but it is now divided into two separate classrooms; Rooms 30 and 31 are now English rooms. I eventually realised why the old circular roof-lights were removed. It wasn’t a maintenance thing after all; there would simply be no point to them anymore because of the new lowered ceilings. 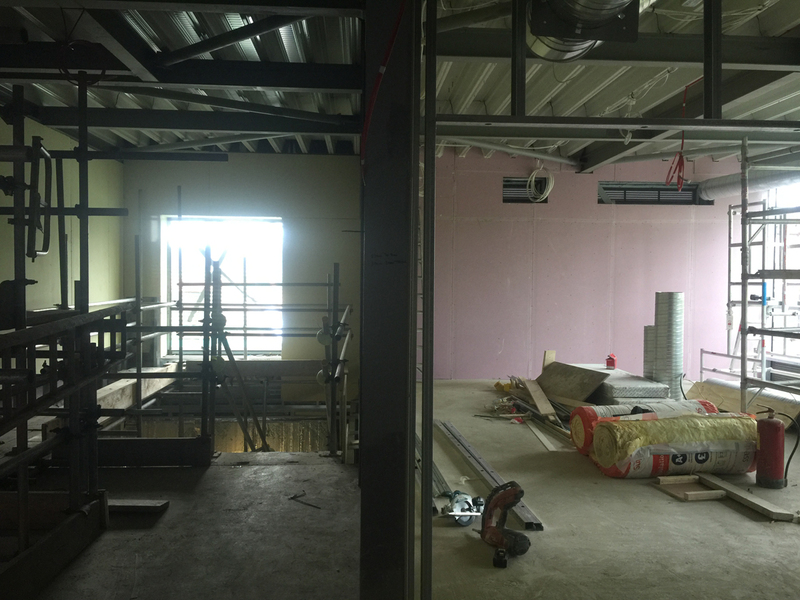 The Old Library/ICT Suite has now been converted into two English classrooms: Room 30 (above) and Room 31 (below). 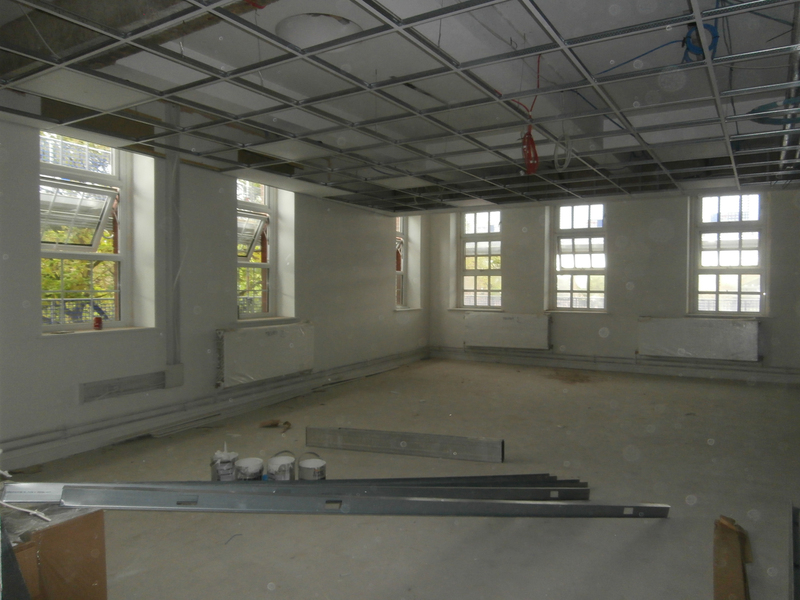 As with all NHSG’s rooms now, both have lowered ceilings. My tour of the Second Floor ended that day at the top of the new north staircase within the glass-fronted infill extension. 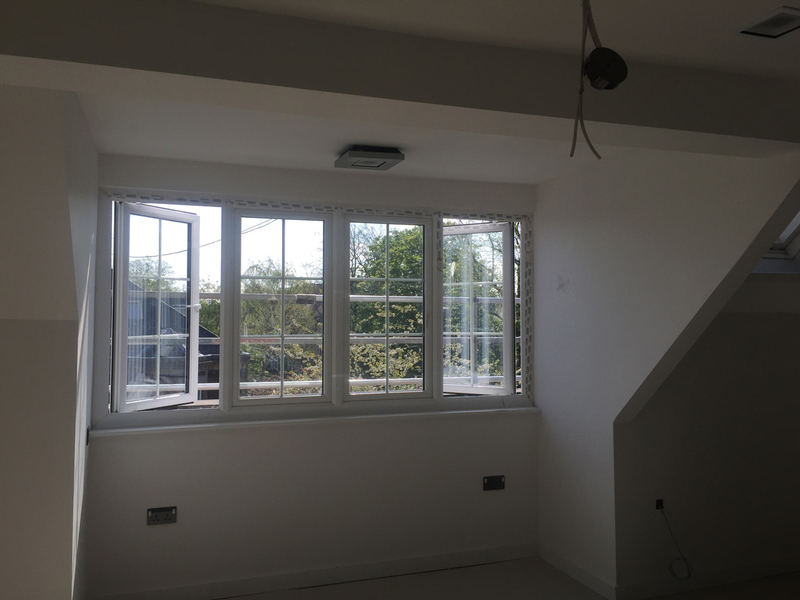 Owing to the addition of a large window in the west wall of the second floor landing – in addition to the replacement glass roof-light I have already reported on in an earlier post – there is now a lot of light flooding into this area of the building. Even though there is now a wall between the stairwell and the infill’s second floor glass-fronted classroom, Giuseppe’s photograph shows this fact really well. The infill extension’s upper storey: stairway, lift-shaft and large window (left), glass-fronted English classroom (right). As I have said, this was the last time I set foot inside either of the buildings before NHSG moved to Tankerville at the end of August. Because of this, I can’t provide any more slideshow tours like the one which ends this post, but I found other ways to tell the story. When God closes a door, he always opens a window elsewhere. Luckily, I’d photographed all the structural changes by then and all that followed internally was just the addition of fixtures and fittings. If you’re intending to join us for the Church High Alumnae Lunch at 11.00 am on Saturday 24th September, you’ll be able to see the final stage of the redevelopment yourself as you tour both the buildings. And perhaps that’s the best way. God’s timings are always perfect.